Addictive trivia app for teens and adults makes learning cool and fun, but players need discipline to avoid extra purchases and digital "stranger danger." Trivia Crack is a social, user-friendly, digital version of Trivial Pursuit, with add-ons to give the game more variety and make it more "addictive." 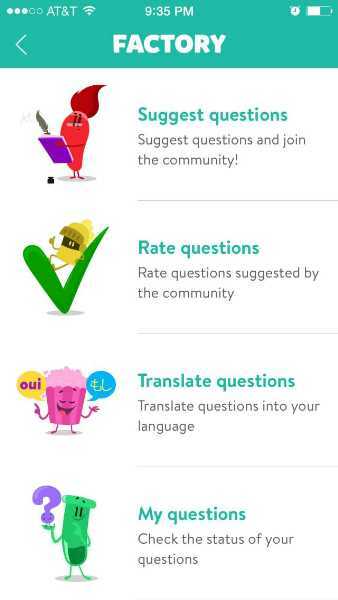 Kids can play against friends or strangers to collect characters from every category by answering trivia questions submitted by other users. If they're stuck, kids can also strategically spend play money to get more time or more lives or use power-ups, which are similar to lifelines in Who Wants to be a Millionaire?. 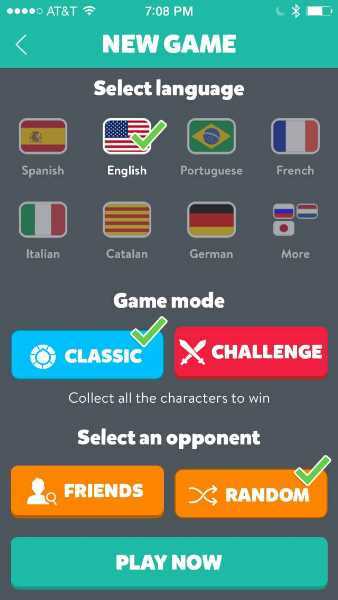 With 10 languages and counting, Trivia Crack is taking the world by storm. To get started, players need to login with email or through Facebook. Then, they can search for friends or just start a game with a stranger. Tapping to spin the wheel gives kids the chance to answer a multiple choice question in one of six categories: art, entertainment, geography, history, science, or sports. After three correct answers or a lucky spin, kids have a chance to win a character -- an engagingly animated take on the "pie" pieces in Trivial Pursuit. A wrong answer at any point ends the turn. To keep things interesting, there are a number of variations on this general theme. For example, instead of earning their own characters, players can try to steal them from opponents through a head-to-head duel answering the same questions. They can also choose to play in challenge mode against multiple opponents at once. 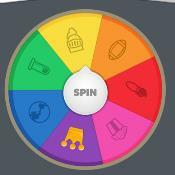 As the name implies, Trivia Crack aims to be addictive, and it succeeds. The game design is user-friendly and straightforward, with a blend of chance and choice that keeps players engaged. The animated characters and incorporation of challenges and lifelines really spice up the typical Trivia Pursuit format. Having user-submitted and user-reviewed questions keeps the questions fresh and gives players a sense of ownership. Engaging in trivia competitions with friends feels somewhat social and educational, making it easy to justify "just one more game." Games will even expire if players don't take their turn in time! However, this is a game that encourages playing and even chatting with strangers. 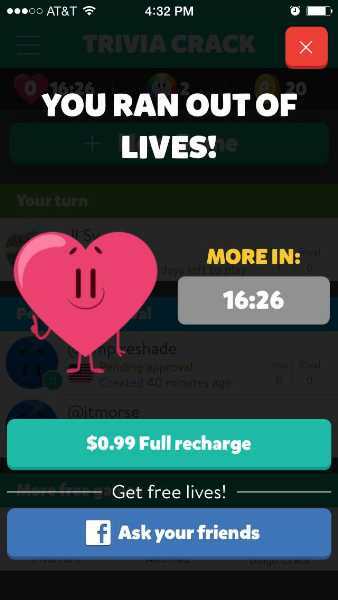 You can get free lives for asking your Facebook friends to play. And players will see Facebook photos of other players -- including strangers -- who submitted trivia questions. Parents should talk with their teens about the risks of playing games with strangers and develop a policy that works for their family. It's fair to say that the makers of Trivia Crack didn't make the game addictive in order to promote trivia knowledge worldwide. There are a lot of opportunities to spend more money, even in this ad-free version. The absence of ads doesn't keep the makers of Trivia Crack from advertising their own games at the bottom of the screen or from frequently interrupting play to point out opportunities to spend coins. 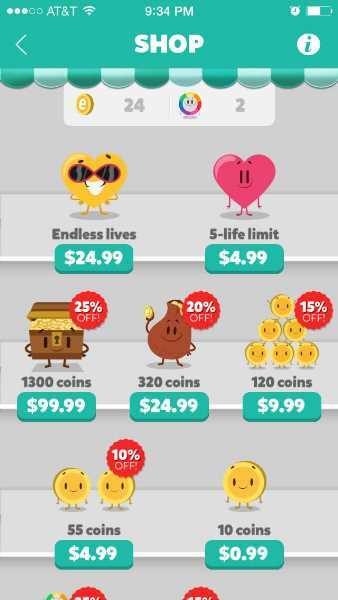 Players collect coins in the game by doing well and spend coins to keep doing well, which eventually makes it enticing to spend real money — even up to $99.99 for 1300 coins (an in-app purchase (IAP) amount we find unconscionable in any mobile game). 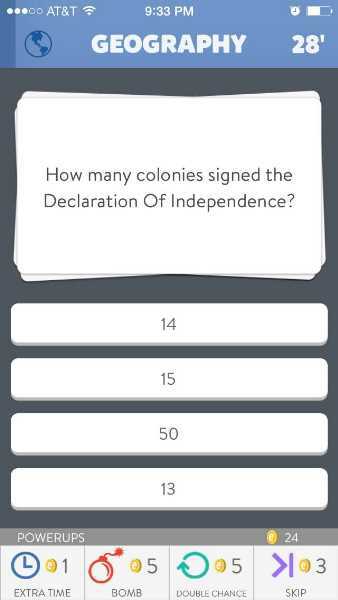 Trivia Crack is best for teens who have developed a strong sense of digital safety and the discipline to avoid playing with strangers and making in-app purchases. For older kids with their wits about them, Trivia Crack isn’t a bad way to fill times when waiting is required. It is also a fun way to keep a family engaged during a road trip if one person reads the questions out loud for the group. This Trivia Crack app review was written by Liz K. McKinney.